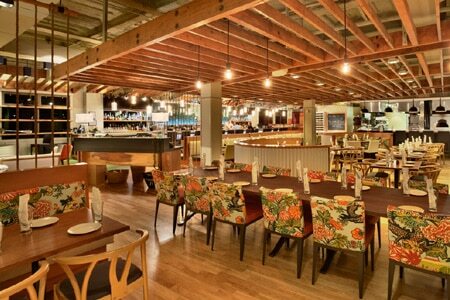 Combining chef Peter Merriman’s locavore and Hawaii regional cuisine with a complementary ambience. : Monkeypod Kitchen, always buzzing, boasts an interior created by local monkeypod wood craftspeople and a menu that takes cues from the successes of chef-owner Peter Merriman’s many years as one of Hawaii’s regional cuisine masters. The mission at Monkeypod? “Merrimaking.” There’s plenty of fresh fish prepared in familiar ways: tacos, fish ‘n’ chips and poke; salads composed with locally sourced ingredients (the restaurant also uses island-raised beef and free-range proteins); hand-tossed pizzas that emerge from the kiawe wood-fired oven; and hand-made cream pies. The bar is known for its extensive array of beers, craft beers on tap, and a progressive cocktail menu and wine list.